We started with a 12×12 piece of paper for the background. 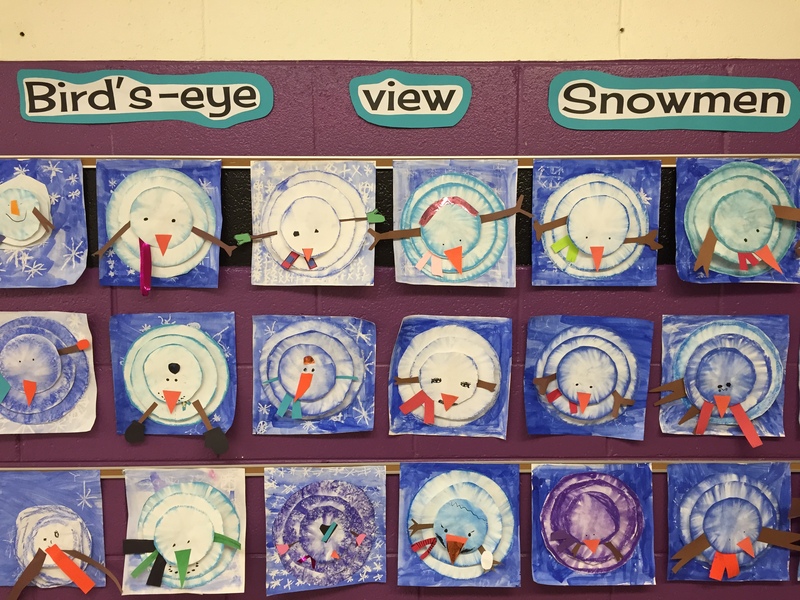 We added snowflakes and swirls and dots with a white crayon and then painted with blue watercolor. 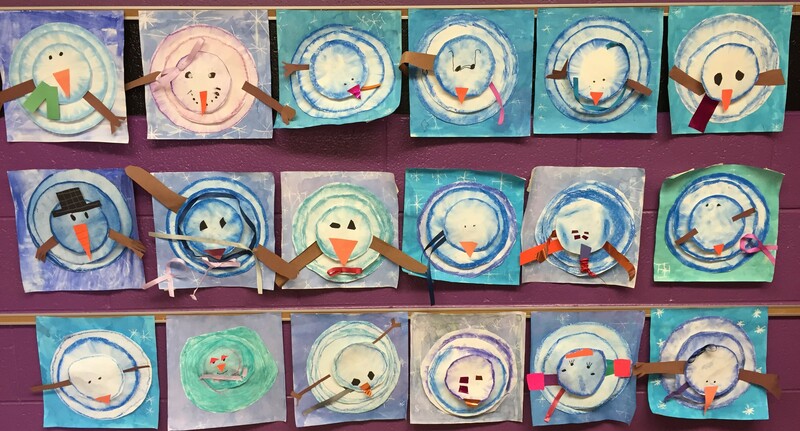 Then we used blue or purple chalk pastels to draw a circle inside each of our snow balls ( traced the 3 different sized snowballs previously for them on 12X18 paper). We used our fingers to smudge around the edges to give it a more 3d quality. Pass out tacky glue for students to use (collect at end of class). Stress to the students that the cap on the tacky glue is tiny and it is really important they don’t lose it. A good place to keep it while in use in inside the table buckets . When collecting glue at the end make sure there is a cap on each glue bottle. Glue the largest circle to center of to the background. I had small squares of cardboard cut for them to stack two together between the remaining layers of the snowman. (4 squares of cardboard total for each student, 2 stacked between first and second layer and 2 stacked between second and third layer). Allow students to visit the cart of scrap paper. Each drawer has a different color paper in it. 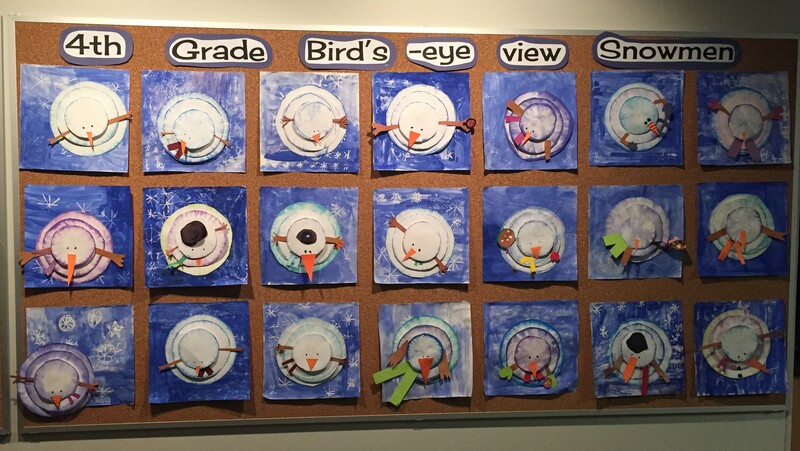 They may use scraps to add stick arms and a scarf to the middle layer of the snowman and carrot nose to the top layer. Tell them they can get creative and add things like mittens if they would like. students can use black sharpie marker to add eyes and details to snowman. Thanks to Tiny Art Room for my inspiration!